Well, pictures are out on twitter now - the new FireBrick sort of exists - but don't go trying to order them yet. We have many more steps to take before we will have stock, some months (I'll have a better idea tomorrow). There are little details like EMC testing for CE marking, and so on, some of which could causes delays. And still, it is made in UK! However, seeing as there are pictures, I think I should say a few words about the new FireBrick model, the FB2900. This should avoid speculation, at least. We are still selling the FB2700, and I am not in a position to say anything about FB2900 pricing yet, this is purely some technical comment. That is not the whole box, with no SFP screen or light pipes, etc. But you can already see some of the changes. One of the most obvious changes is that we have moved back to a 5 port format, as we had on the older FB105 models. But the extra port is SFP. This means it will be able to take a normal copper Ethernet port, but also various types of direct fibre links. Apart from use in data centres, and one each end of fibre links between buildings, this is thinking ahead to the days of true fibre internet services in the future. Anyone that has looked inside the existing FB2700 model will see we have a completely new PSU design. The change in design has allowed us to make a variety of different PSU options. We have an option for automotive (12V and 24V). This is far more complex than it sounds - really! Automative supplies allow for something called "alternator load dump", and high voltage spikes, and a range of voltages from the supply. They have a lot of safety aspects to consider as well. However, this allows for FireBricks to run in cars, and trucks, and alarm panels, and all sorts of places where there are DC supplies. We also have an option for higher DC voltages found in telecoms racks in data centres (-48V), an option we already have on the FB6000 series. Even the mains voltage option is different, with the main board using 12V, we have a wide choice of suppliers for the PSU components. We have stuck with the "figure eight" power lead though. Faster, better, stronger, we can rebuild it... etc, etc. The new design has a faster processor, and removes a key limitation that stops the FB2700 doing much more than 350Mb/s. We have not got to the stage of benchmarking yet but expect it will be a lot faster. We are expecting faster crypto as well - we'll say more on that once we do have it all coded and benchmarked. We have said this before so many times and not followed through, but this time it is real, honest. We have wall mount brackets and 19" rack mount brackets (for one or two FB2900s in 1U). I know, pics or it did not happen - just watch this space. Obviously we are always adding more to the firmware and more features will come along for the FB2500, FB2700 and FB2900 models. Software upgrades are still free, as always. P.S. (and it should not be a P.S.) there are some good people working on making this happen, like Cliff and Kev, and they need some credit for this all coming together. Excellent! And rack brackets too! Not sure who does your metalwork, but they've done a great job there. You mention an FB9000 in this post, but I can't find such a thing on the FireBrick website - typo, or admission to the existence of the FB6000's replacement? Oops, FB9000 in the pipe line, I mean FB6000, corrected! So pleased to see a proper psu board in there... can we get that retrofitted for the fb2700 too please? will the FB2900 have any features the FB2700 doesn't? I expect that there, in time, will be features that the 2500/2700 cannot do but we can add to the 2900. It had different processor, memory, flash, etc. sounds reasonable. 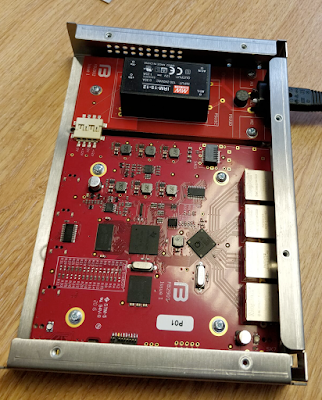 Do you have any idea when you expect to stop producing firmware updates for the FB2700? I am not sure we will stop - if there are changes that can apply to all versions, then they will apply. It is the same code base. If we ever move to a completely new code base on some future product then maybe. This looks really cool and I hope that you would have made things perfect after bricking it. What processor is it using? I can't understand the continued focus on hardware in this day and age. Yes, it has a place, but I really can't think of many other vendors which don't offer a virtual option. Do the firebricks use fq_codel anywhere currently? Is Firebrick open to feature requests?